As the famous quote says, “There is a first time for everything.” Same goes with marijuana growing. 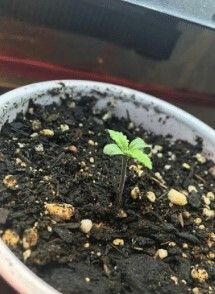 The first time a grower plants a seed into soil can be pretty unnerving, yet the most exciting thing that happened to them. However, that excitement can also cause some problems for them. Their eagerness leads them to do things only advanced growers can manage. Nonetheless, in growing marijuana, everything is worth a try in trying to gain the highest yield. For Trizzle2011’s first grow, he went with Purple Haze from ILGM. Then, after doing some research, he attempted to do a technique only experts can manage. Will he and his plants be able to survive? A quick smoke of the buds from this strain reminds one of the times where everything can be as carefree as possible. This sativa-dominant strain induces a dreamy, nostalgic euphoria that delivers high-energy cerebral stimulation. It awakens creativity and blissful contentment that can last a whole day. First-time grower, Trizzle2011, germinated ILGM Purple Haze seeds in a wet paper towel. He made sure that the tap water used for the towel is pH’d to 6.0 to 6.5. It only took 3-1/2 days for the seeds to sprout. Once they started popping out, the grower transplanted them in solo cups with holes at the bottom for drainage. These cups have Fox Farm Ocean Forest soil in them. For the past 18 days, the seedlings got nothing but watering every other day. One T10 and 100-watts CFL work for 24-0 daily. The first topping happened at the first internode, the following occurred at the second ones. Covertgrower advised to transplant the Purple Haze into bigger pots as they might already be root bound. Moving them to bigger pots is Trizzle2011’s agenda for today. Just in time because they are at the beginning stages of possible root bounding as they start to amass at the bottom of the solo cups. Trizzle2011’s research show that Purple Haze plants look best when mainlined. That is what he decided to do for these ladies. So far, there are some growth in the lower branches. Mainlining means training the cannabis plant to form a “hub” or “manifold”. With this technique, branches are expected to grow from a single node. It is the 24th day and the last time the Purple Haze would be under a single Viperspecta 450-watts LED light. Two more would sit about 18” away starting tomorrow. About the manifolds, there appears to be some problem with it. Instead of one, somehow the plants ended up with two. Trizzle2011 figured maybe instead of cutting the first node, he accidentally cut the second one. Another thing that is of concern is the plants’ nitrogen uptake. To remedy, brewed Xtreme Tea now flows in the soil. A common method is watering in circles around the outside parts of the plants. This technique allows the roots to seek out the water thus, encouraging root growth. Keeping the nitrogen’s level is a bit of a struggle. If he wants to maintain its level, Trizzle2011 figured that the best way is to acquire an adequate watering schedule. Watering with two gallons of water every five days is a good starting point. Slowly, organic fish emulsion and would supplement these watering. This method is actually on trial for a few days already. So far, the top 2” of the soil is dry, underneath is moist after the last watering. Two of the main fan leaves started displaying abnormal discoloration as they appear to decay. Trizzle2011 describes it as something similar to decaying leaves, brown as if the leaves are completely dry. No matter what kind of support is given, the new growths end up weighing these fan leaves down. One possible culprit is these leaves touching the soil most of the time. If time comes that this discoloration affects other leaves. The pH tester used in this grow is also not properly calibrated. The grower does nothing and sticks the tester wherever needed. However, he prefers using drop testers that only turn yellow as the pH Up/Down is added. Now, the next steps would be taken very carefully. Trizzle2011 is kin to make sure that future nutrients and supplements for this grow would have low pH levels. Starting with the organic fish emulsion because a heavy feeding of it made the ppm soar to 5,600. One more thing that clouds his thoughts is the idea that there must be something done that caused some stunted growth. Either the mainlining happened early or the position of the T10 light stopped their stretching. Not sure yet which is which. Also, while trying to figure out what the problem is, a node fell to a victim to snipping and a leaf to ripping. Damaged leaf now sits in a water solution with 4.0 pH and seaweed extract. Then, injured fan leaves have normal watering solution instead. Continuing with the experiment, Trizzle2011 split the stem of four perfectly healthy fan leaves and injected normal watering solution. The logic behind this is the damaged leaves does not look damaged at all and appears perfectly fine. Throughout the journey, these leaves would receive watering solutions at different pH levels and even some seaweed extracts. Part of the test is to see how the leaves react to these differences. Then, he realized that part of the problem with the leaves is the lumens. To maximize the light penetration, Trizzle2011 put a tin foil underneath the foliage. The foil helps disperse the light to places it cannot reach. Light meter proved that this is a very efficient technique. Although, as of the moment the light disperses everywhere which has the grower thinking twice about this tin foil invention. The watering solution experiment came out as a fail and the leaves ended up drying. New plan is to germinate new seedlings and grow them for at least two weeks and resume testing. Also, this time, no T10s and straight LED lights would be used instead. Once again, Trizzle2011 topped both plants. There were about 10 terminal buds on one plant, and 9 on the other. All in all, he figured there would be at least 20 colas for harvest. As for the tin foil idea, it may have back fired. Fungus gnats found its way in the soil which may be the result of the creation of a convenient environment for them to thrive in under the foil. Although, the gnats coming from the soil itself has not been ruled out yet. The gnats must have called some friends and asked some spider mites to join them. Although, only one of them shows up per inch of soil. Still, “Prevention is better than cure.” The leaves get misted every morning and night and so far, it has done a good job of keeping the insects away. Misting is enough until the diatomaceous earth arrives. Trizzle2011 also flushed with 2 gallons of fresh water to ease the infestation. Also, it has been about 10 days since the Purple Haze got watered. Nonetheless, the bottom of soil is still wet. After today’s flushing, a soil test proved that the nutrients were a little bit hot. A couple of leaves dried up and was not looking in tip top shape and this may be the reason why. Nonetheless, the grower wanted to focus on keeping the mites and gnats away. So, the plan is to keep the top two inches of the soil moist until the humidifier arrives. After taking more than 20 soil samples last night, Trizzle2011 is positive that no mite is present in the soil for now, only one gnat. Dr. Earth Pest Spray now guards the plants, along with a good layer of diatomaceous earth. The lady on the right is one that Trizzle2011 thinks is a runt. Week four of vegetation it still has not caught up with the other Purple Haze and it is getting him worried. However, this was also the one that suffered a blow when the grower accidentally snipped a node. Amazingly, it has healed into a big and healthy knuckle. It would not be too long until Trizzle2011 would decide to flip these ladies to flowering. Apparently, two days after the last post, the Purple Haze plants transcended to flowering. A week into the cycle, they have already perked up and are reaching high for the light with greener colors. If there is one thing that Trizzle2011 learned the hard way is that investing in the right meters and testers brings a whole lot difference to the plants. When the ladies were only in vegetation, the temperature has been consistent at 65 to 70°F. Ever since switching to flowering and blasting the lights on full spectrum, the temperature always sits at 80 to 85°F. Although, thanks to the higher amount of par, the plants are back to proliferating. As of the moment, the light hangs about 15” from the top of the canopy. Once the grower switched to flowering, the feeding with Maxi Bloom and Cal-Mag began which caused the pH to jump to 6.8. Four days after, he did a water, Cal-Mag, seaweed extract, neem oil and the pH lowered to 6.5. So far, the light measures 1,500 PAR at the center and about 500 PAR around the outside of the canopy. It really is starting to get hot and the lights are about 10” away from the top canopy. From this point on, Trizzle2011 would monitor the conditions of the canopy to prevent possible burns. As the foliage gets thicker, the bud sites show themselves more. The runt on the right does not seem to show much difference to its sister. Now that the girls are a couple of weeks in to flowering, the updates rarely come. Although, when they do, Trizzle2011 always surprises with the Purple Haze. As of today, the buds are all dense and heavy on the colas. There is a bit of leaf curls but the RH (relative humidity) level is at 80%. This grow got Trizzle2011 all excited for the next round of grow. Wanting to change things around here, the Purple Haze went down earlier than expected. Nonetheless, a wave of delight happened for the grower as all buds turned out purple. The buds from the central canopy weighed heavier than the others and has more trichome production. So far, the popcorn nuggets weighed at least 100 grams and 560 grams wet weight of the buds. Be fearless. Manifolding is something that only expert growers try. However, after some research, Trizzle2011 found that it is the best for Purple Haze, so he tried and was not disappointed with the results. Be fearless, growing marijuana is all about trial and errors. Never forget to calibrate your testers. It is not something done once, but growers need to ensure that their testers are well-calibrated before using. A slight misreading of the meters can throw the whole grow out of the window.